Last year it was Gabrielle Douglas. Who is The Nation magazine sports editor’s Sportsperson of the Year for 2013? Time magazine has named Pope Francis as its Person of the Year. It is hard to quarrel with their choice of a pope who attacks the “idolatry of money,” not to mention a pope who when asked about gay members of the clergy said, “Who am I to judge?” Oh, and the fact that he makes Rush Limbaugh burst a vein is just a bonus. That said, Pope Francis would not have been my choice. For me, a “Person of the Year” is someone who is the personification of the issue that has shaped society most decisively in the previous calendar year. My choice would have been either the late Trayvon Martin, murdered in 2012 yet immortalized in 2013, or national security state whistleblowers Chelsea Manning and Edward Snowden. These are three people whose legacy will extend far beyond 2013. In considering my Sportsperson of the Year, I apply the same lens: who best represents what I believe to be the most important narrative in the sports world from 2013? The story of the year in sports is, for me, a no-brainer. This has been the year when the “last closet” has been breeched with lesbian, gay, bisexual and transgender athletes, as well as their allies, finally being heard. 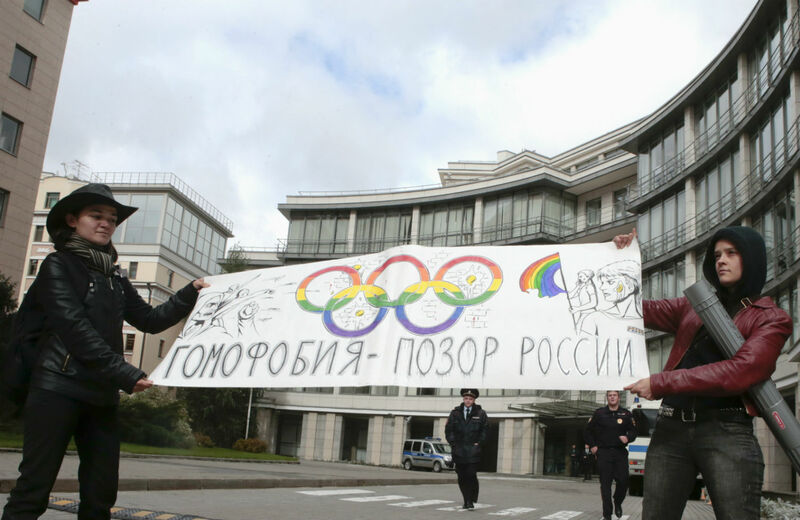 To see athletes like Jason Collins and Brittney Griner come out of the closet; to see LGBT athletes and allies from around the globe pledge to use the platform of the 2014 Sochi Olympics to stand up to Russia’s draconian anti-gay laws; to see organizations like the You Can Play project and Athlete Ally take center state; to see NFL players like Chris Kluwe and Brendon Ayanbadejo helping to lead victorious fights for marriage equality; to see the NFL Players Association sell t-shirts of NFL player/allies, is to indeed see the walls of the “last closet” begin to start tumbling down. My Sportsperson of the Year, however, is none of these people. I was tempted to choose Jason Collins, but the inability of even one NBA general manager to sign Collins to a contract makes his narrative incomplete, not reflecting the hope and possibility that this past year represents. Rogers then the day after Collins came out, signed with the Los Angeles Galaxy. On May 26, Rogers became the first openly gay male athlete to take the field in North America. With that line comes clarity about the people who have truly shaped our world in 2013. Pope Francis is the reflection of changes taking place in our society. Robbie Rogers is that change personified. Rogers said, “It is awesome to be part of a movement that his changing society.” He needed that movement to step forward, but because he was brave enough to not only come out but come back, he is also expanding that movement to empower countless others. He is my Sportsperson of the Year.